Pumpkin is the perfect vegetable for a cream. It has a sweet and kind flavour, a very tasty orange colour, and a super fine texture. It also supports very well the spices and imaginative side dishes. My recipe includes some clams as accompaniment. I think they bring a salty sea contrast for a daily dish. But the soup is also very good without them, if we want a simpler and cheaper version. Heat olive oil in a large pan and cook onion over medium heat. When it starts to be transparent, add garlic and cook for 10 minutes more. Meanwhile, heat a little oil in a sauce-pan. Add the clams, white wine and parsley, and cover. In two or three minutes, when open, remove from heat. Discard those that have not been opened because they were dead, and keep covered. Add squash to onion cut into large dice, peeled and chopped potatoes and curry, and saute. Add the liquid from the clams and the amount of vegetable broth to just cover the pumpkin (slightly less if done in the pressure cooker). Cook until squash and potatoes are tender (20-25 minutes, 10 in pressure cooker). Chop and add a little milk until you have the right texture, neither too liquid nor too thick. With a dull knife, take off the clams from their shells, keeping within them (they will look good and be easy to eat with a spoon at the same time). 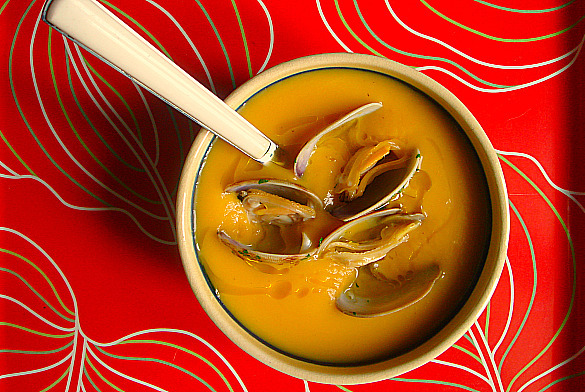 Serve the cream hot with clams on top and a drizzle of olive oil. Qué original con las almejas, así no la he probado nunca pero voy tomando nota. Tiene una pinta estupenda, esto para la cena de Navidad me está gustando mucho. Uauuuuuuu!! esta receta me encanta, había oído la receta en… no se dónde, ahora… pero me quedé con la boca abierta, y mira! aquí está, gracias. Inma, yo mezclo calabaza y zanahoria para otra crema que hago, y sale buenísima. Y si la haces sólo con zanahoria, yo pondría igual dos patatas, para que te quede mejor de textura. Y gracias a todos por los comentarios!